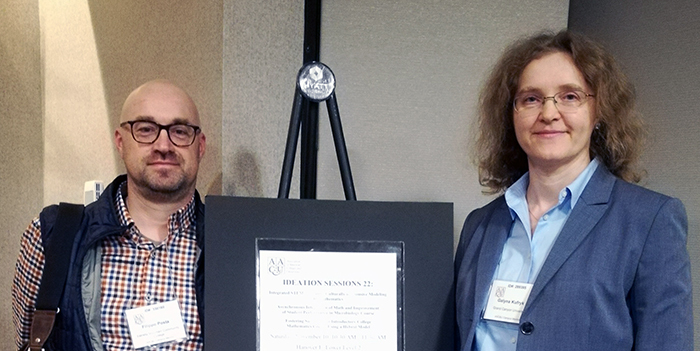 GCU biology professor Dr. Galyna Kufryk (right) noticed that some of her students were struggling with exponential and logarithmic functions in her microbiology courses. So she worked with GCU adjunct math professor Dr. Filippo Posta (left) to come up with a math module to help them. Anatomy, chemistry, biology — those disciplines make sense to students in the sciences. They sit squarely in the science comfort zone for them. But math, on the other hand, isn’t necessarily paint by numbers for everyone. “A lot of them, once they get into a college program that relies on math to a substantial level, if they feel they can’t perform the math, they just drop out. They can’t get through the math, and then it kind of creates a big roadblock for them,” said Grand Canyon University biology professor Dr. Galyna Kufryk, who has spent the past three years trying to knock down that roadblock. She and GCU adjunct math professor Dr. Filippo Posta worked together to create a math guide to help her students get through the math in her microbiology courses. Three years of data have shown this integrative approach to teaching to be a great success. “We were happy to be selected,” Kufryk said. It was in the 2015-16 academic year that Kufryk noticed students were struggling with some of the math in her microbiology classes, specifically when it came to working with exponential and logarithmic functions. One of the math lesson worksheets for Kufryk’s microbiology students. 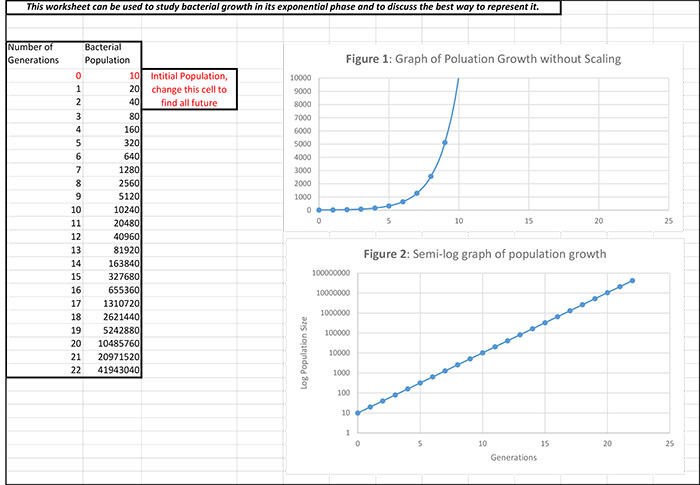 “When we talk about bacterial growth, it’s described as an exponential function. That’s one part of the course where they have to be comfortable working with exponential functions,” Kufryk said. Another part of the course deals with the efficacy of antimicrobial treatments. When students test how efficient a disinfectant might be in killing bacteria, that’s something students must describe mathematically. Students plot their results in a semi-logarithmic scale, in which the number of cells is logarithmic and time is linear. Kufryk decided to do something to help her students and approached Posta about creating a learning module that would target, specifically, what students need to know when it comes to exponential and logarithmic functions. It wasn’t the first time she has taken this integrative educational approach. 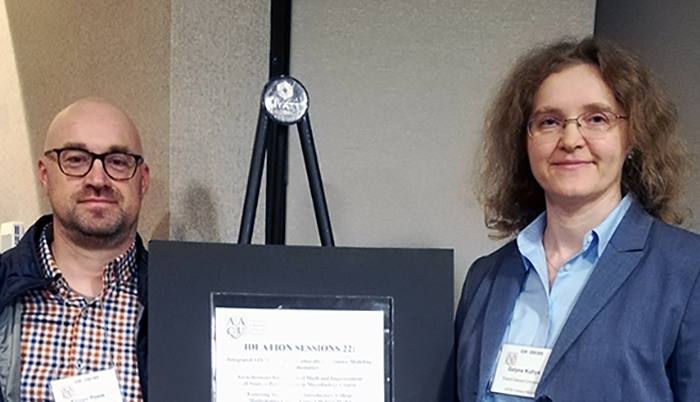 She also worked with Dr. Klaus Mortensen, a professor in GCU’s physics department, to come up with a learning module to help her microbiology students understand how radiation can be used to control microbial growth. What Kufryk and Posta have done is a little different than other approaches in that it hones in on specific mathematical concepts rather than refer students to whole textbooks and “suggested reading” from those textbooks. The math module isn’t a requirement. It’s self-paced and something students can choose to do on their own as a refresher or as an introduction if they never have studied those mathematical concepts before. Students take an assessment to see where they stand with the math. “They have the chance to identify where their weakness is and fix it and go back to study the materials that we provide. Or they can go back to the instructor, if they need, so that we can get them up to speed by the time they need it, because I offer this in class well before they actually need to use these materials,” Kufryk said. Students follow up with another assessment to see how far they’ve progressed. What’s beneficial about this approach is that students tackle the math module on their own time, and they can take as much time as they want so that they aren’t overwhelmed. Kufryk and Posta have been collecting data over the course of three years. They have offered the math lessons to more than 500 microbiology students in that time, gathering feedback and adjusting the math lesson to make sure the intervention fits students’ needs. The results have spoken loudly to the two professors. “The 10 percent increase was indeed a nice surprise, especially given all of the statistical analysis that we did to confirm it,” said Posta. Looking at the bigger picture, helping students get through the math could help with retention in the STEM disciplines. “The data shows that 48 percent of students that choose to major within STEM disciplines, they’re going to switch to non-STEM or leave college without completing a degree if they’re not doing well in math,” Kufryk said. This integrative math-science approach is a bright note, considering the Program for International Student Assessment reported in 2015 that the United States ranks 39th in math internationally, with scores being at least 62 points below the average scores of the top five performing nations: Singapore, Hong Kong, Macau, Taiwan and Japan. PISA looks at the performance of 15-year-olds in math, science and reading and releases its report every three years. Kufryk also noted how the World Economic Forum ranked the U.S. 10th among 137 countries in 2017-18 in the quality of math and science education. She said when she saw her students struggling with the math in her microbiology courses, she had two options — either to gloss over the math or to teach it.